Halifax (/ˈhælɪfæks/ HAL-ih-faks) is a minster town in the Metropolitan Borough of Calderdale in West Yorkshire, England. Historically in the West Riding of Yorkshire, the town has been a centre of woollen manufacture from the 15th century onward, originally dealing through the Piece Hall. Halifax is known for Mackintosh's chocolate and toffee products including Rolo and Quality Street. The Halifax Bank was also founded and is still headquartered in Halifax. Dean Clough, one of the largest textile factories in the world at more than 1⁄2 mile (800 m) long, was in the north of the town. The premises have since been converted for office and retail use including a gym, theatre, Travelodge and radio station. The town's name was recorded in about 1091 as Halyfax, from the Old English halh-gefeaxe, meaning "area of coarse grass in the nook of land". This explanation is preferred to derivations from the Old English halig (holy), in hālig feax or "holy hair", proposed by 16th-century antiquarians. The incorrect interpretation gave rise to two legends. One concerned a maiden killed by a lustful priest whose advances she spurned. Another held that the head of John the Baptist was buried here after his execution. The legend is almost certainly medieval rather than ancient, although the town's coat of arms carries an image of the saint. Another explanation is a corruption of the Old English hay and ley a clearing or meadow. This etymology is based on Haley Hill, the nearby hamlet of Healey (another corruption), and the common occurrence of the surnames Hayley/Haley around Halifax. The erroneous derivation from halig has given rise to the demonym Haligonian, which is of recent origin and not in universal use. The Earldom of Halifax took the name of the town. Its first creation[clarification needed], in the Peerage of England in 1677, was for William Savile, who was created Baron Savile of Eland and Viscount Halifax in 1668 and later became the Marquess of Halifax (this creation of the earldom became extinct in 1700). George Montagu-Dunk, 2nd Earl of Halifax, (2nd order of the 3rd creation) became the President of the Board of Trade in 1748. In 1749 the city of Halifax, the capital of Nova Scotia, Canada, was named in his honour. The Halifax River in Central Florida, United States, was also named after him. Halifax is not mentioned in the Domesday Book, and evidence of the early settlement is indefinite. By the 12th century the township had become the religious centre of the vast parish of Halifax, which extended from Brighouse in the east to Heptonstall in the west. Halifax Minster, parts of which date from the 12th century is dedicated to St John the Baptist. The minster's first organist, in 1766, was William Herschel, who discovered the planet Uranus. The coat of arms of Halifax include the chequers from the original coat of arms of the Earls Warenne, who held the town during Norman times. Halifax was notorious for its gibbet, an early form of guillotine used to execute criminals by decapitation, that was last used in 1650. A replica has been erected on the original site in Gibbet Street. Its original blade is on display at Bankfield Museum. Punishment in Halifax was notoriously harsh, as remembered in the Beggar's Litany by John Taylor (1580–1654), a prayer whose text included "From Hull, from Halifax, from Hell, ‘tis thus, From all these three, Good Lord deliver us.". The town's 19th century wealth came from the cotton, wool and carpet industries and like most other Yorkshire towns, it had a large number of weaving mills many of which have been lost or converted to alternate use. In November 1938, in an incident of mass hysteria, many residents believed a serial killer, the Halifax Slasher, was on the loose. Scotland Yard concluded there were no attacks after several locals admitted they had inflicted wounds on themselves. Halifax plc started as a building society, the Halifax Permanent Benefit Building and Investment Society, in the town in 1853. Today the bank operates as a trading name of HBOS, part of the Lloyds Banking Group. Yorkshire Bank, based in Leeds and known as the West Riding Penny Savings Bank, was established on 1 May 1859 by Colonel Edward Akroyd of Halifax. Halifax is twinned with Aachen in Germany. The A58 has a stretch called Aachen Way. Halifax has benefited from Single Regeneration Budget, European URBAN II and the Home Office’s Community Cohesion Fund money through Action Halifax  who have a vision for "a prosperous, vibrant and safe centre where all sections of the community can access opportunities to enhance their quality of life." The ancient parish of Halifax was divided into a large number of civil parishes in the 19th century. In Halifax, a body of improvement commissioners or town trustees was created between 1762 and 1823, and the town became a borough constituency under the Great Reform Act of 1832. Halifax was incorporated as a municipal borough in 1848 under the Municipal Corporations Act 1835, and, with the passing of the Local Government Act 1888, became a county borough in 1889. Since 1974, Halifax has been the administrative centre of the Metropolitan Borough of Calderdale in West Yorkshire. 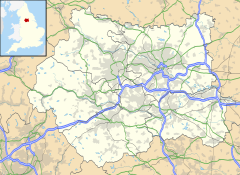 Topographically, Halifax is located in the south-eastern corner of the moorland region called the South Pennines. Halifax is situated about 4 miles (6 km) from the M62 motorway, close to Bradford and Huddersfield. The Tees-Exe line passes through the A641 road, which links Brighouse with Bradford and Huddersfield, The town lies 65 miles (105 km) from Hull and Liverpool, and about 170 miles (270 km) from the cities of London, Edinburgh, Belfast, Dublin and Cardiff as the crow flies. The Hebble Brook joins the River Calder at Salterhebble. In 2004 Calderdale had a population of 192,405, of which 82,500 live in the Halifax urban area. The main ethnic group in Halifax is White (87%), followed by Pakistani (10%). Over 90% of people aged 16–74 were employed, mostly full-time. 64% of residents had qualifications. Halifax is home to a large South Asian community mainly of British Pakistanis from the Kashmir region, which originally moved to the area for employment in the textile industry. The majority of the community lives in the west central Halifax region of the town, which was previously home to immigrant Irish communities who have since moved to the outer suburbs. The Illingworth / Mixenden areas, in contrast to west central Halifax's ethnic diversity, consists mostly of white, indigenous Protestant residents. In the 2001 census, 5% stated they were Muslim, 16.3% of no religion, and 63.8% of Christian background. 12.8% did not disclose their religion. The population density of the Halifax urban area is 530/km2. As well as the significance of the bank Halifax plc which, since 2008, is part of the Lloyds Banking Group, the town has strong associations with confectionery. John Mackintosh and his wife, Violet, opened a toffee shop in King Cross Lane in 1890. Violet formulated the toffee's recipe. John became known as "The Toffee King". A factory was opened on Queens Road in 1898. A new factory at Albion Mill, at the current site near the railway station, opened in 1909. John died in 1920, and his son Harold not only continued the business but took it to the present size and range of confectionery it has today. Their famous brands, including Rolo, Toffee Crisp and Quality Street of chocolate and confectionery are not just popular in the UK, but around the world including the USA. In 1969 John Mackintosh & Co Limited merged with the York-based Rowntree Limited to form Rowntree Mackintosh. This was, in turn, purchased by Nestlé in 1988. Halifax was a busy industrial town, dealing in and producing wool, carpets, machine tools and beer. The Crossley family began carpet manufacture in modest premises at Dean Clough, on the banks of Hebble Brook. The family was philanthropic and Joseph and Sir Francis Crossley built and endowed almshouses for their workers, which exist to this day and are run by volunteer trustees. Halifax is also home to Suma Wholefoods, which was established in 1975 and is the largest workers' co-operative in the UK. Public bus and train transportation in Halifax is managed and subsidised by the West Yorkshire Passenger Transport Executive. It was announced in January 2009 that Halifax was to have a direct rail link to London after a long campaign backed by many, including the local paper the Courier; the service began to run on 23 May 2010. Most of the bus services in Halifax operate from the town's bus station. Unlike many other bus stations, Halifax is noted for having much character, with many listed buildings being incorporated on the site. First Calderdale & Huddersfield operate most of the town's services, while Yorkshire Tiger operate many of the south Calderdale services. Arriva Yorkshire operate services that link Halifax with the West Yorkshire towns and cities of Dewsbury and Wakefield. First operate bus services from Halifax to the town of Huddersfield and the nearby cities of Bradford and Leeds. First also run services into other counties, Rochdale in Greater Manchester and Burnley in Lancashire. Other bus operators in the town include T.J. Walsh (also known as the Halifax Bus Company) and Halifax Joint Committee which use the livery of the old Halifax Corporation buses, used on the town's buses until 1974. Halifax railway station is on the Caldervale Line, with services to Manchester Victoria, York, Selby via Bradford and Leeds; Blackpool North; via Brighouse to Huddersfield and Wakefield Westgate and to London King's Cross via Wakefield Kirkgate. All but the London service are operated by Northern. Rail passenger representation is organised by the local users' group, the Halifax and District Rail Action Group (HADRAG). The rail line leading from Halifax due north towards Keighley (and thus towards Skipton, Morecambe and Carlisle) with a further branch to Bradford via Queensbury saw its last through services in May 1955, although parts of the route, which was extremely heavily engineered with long tunnels and high, spectacular viaducts, have now been repaired and revived by Sustrans as a walking and cycle route. In 2018 a campaign was launched to save and restore the 2,500 yards (2,300 m) Queensbury Tunnel and add it to the walking and cycling network. A branch from Holmfield, on the Halifax to Queensbury section of the lines to Keighley and Bradford, served the west side of Halifax. It terminated at St Pauls station. This short branch closed to passengers in January 1927 and to all traffic in June 1960. Halifax is also served by Sowerby Bridge railway station on the southwest edge of the town, just to the south of the River Calder. Calderdale's BBC local radio station is BBC Radio Leeds. Calderdale's local radio station, Phoenix Radio 96.7 FM has its studios in Halifax, and the Courier, Calderdale's local weekly newspaper, has its offices in the town. The Halifax area is home to two selective state schools, which are the Crossley Heath School in Savile Park and North Halifax Grammar School in Illingworth. Both schools achieve excellent GCSE and A-level results with both schools achieving a large proportion of A*to C grades at GCSE level. In 2005, the Crossley Heath School was the highest ranking co-educational school in the North of England. Calderdale College is a further education college located on Francis Street, just off King Cross Road, in the west of the town. The Maltings College opened in 2013 and offers a range of vocational sixth form courses. In December 2006 it was announced that Calderdale College, in partnership with Leeds Beckett University, opened a new higher education institution in January 2007 called 'University Centre Calderdale'. The Duke of Wellington's Regiment (West Riding) Regimental Association, previously based at Wellesley Park, on the junction of Gibbet Street and Spring Hall Road, in the former Wellesley Barracks is located within the Bankfield Museum on Boothtown Road. The former barracks was converted into an educational school in 2005. Former regimental colours of the 'Duke's' are laid up in the Halifax Minster. These include the stand used by the 33rd Regiment between 1761 and 1771, which is one of the oldest in existence in England, plus those carried by the regiment during the Battle of Waterloo and the Crimea. The 1981 stand of colours, was taken out of service in 2002. They were marched through the town from the town hall to the minster, which at that time was still a parish church, accompanied by two escorts of 40 troops, the Regimental Drums and the Heavy Cavalry and Cambrai Band on Sunday 31 March 2007. The troops were then inspected by the Lord Lieutenant of West Yorkshire, Dr Ingrid Roscoe BA, PhD, FSA and the Mayor of Halifax Cllr Colin Stout making a total of eight stands of colours within the Regimental Chapel. The regiment was presented with the "Freedom of Halifax" on 18 June 1945. Eureka! The National Children's Museum was inspired and opened by Prince Charles in the summer of 1992 and is in part of the railway station. Once the home of the diarist Anne Lister, Shibden Hall is just outside Halifax in the neighbouring Shibden Valley. Dean Clough, a refurbished worsted spinning mill, is the home of Barrie Rutter's Northern Broadsides Theatre Company and the IOU theatre company as well as providing space for eight art galleries. The Artworks is a collection of artists studios, gallery space and an art school housed in an old mill complex just to the south of the town centre. A recent survey showed Halifax to have above average levels of drink-related violence and associated issues. Piece Hall is the former cloth hall, where pieces of woollen cloth were traded. Opened on 1 January 1779, trading took place for two hours on a Saturday morning in a total of 315 merchant trading rooms. After the mechanisation of the cloth industry, the Piece Hall became a public market. Piece Hall is host to many arts, crafts and independent shops. The Piece Hall has recently undergone a £19 million conservation and transformation programme. The works were completed in July 2017, with the building fully reopened in the August (on Yorkshire day) with shops, cafes and events. Dean Clough Mill located beside the Victorian Gothic Revival North Bridge was built in the 1840s–'60s for Crossley's Carpets, owned by John Crossley and was once the largest carpet factory in the world. It was converted to a business park in the 1980s. Halifax Town Hall was designed by Charles Barry, who also designed the Houses of Parliament, in 1863. Borough Market is a Victorian covered market-place in the town centre. Wainhouse Tower, at King Cross, is a late Victorian folly constructed between 1871 and 1875. Originally intended to be the chimney for a dye works, it became a folly after the dye works was sold in 1874 and the new owner refused to pay for its completion. It is the tallest folly in the world and the tallest structure in Calderdale. People's Park is a public park originally designed by Joseph Paxton, given to the people of Halifax in 1857 by Sir Francis Crossley. The Prescott Street drill hall designed by Richard Coad and completed in 1870. The Shay, the town's football and rugby league stadium. The town has relatively successful sports clubs. Its rugby league club, Halifax RLFC, plays in the Co-operative Championship. The town's football team, F.C. Halifax Town participates in the National League, the fifth tier of English football. The Shay football ground has been the home of the town's football club since 1921. The ground was substantially redeveloped in the late 20th and early 21st centuries, with money provided by the Football Foundation and funds raised or provided by the local community and Calderdale Council. Halifax is home to the professional rugby league academy, Halifax Elite Rugby Academy, which has a partnership with Huddersfield and Castleford. Halifax RLFC is one of the most historic rugby league clubs in the game, formed over a century ago, in 1873. Amateur clubs Boothtown Terriers, Greetland All Rounders, Illingworth, King Cross Park, Ovenden, Siddal and Stainland Stags are based in or near the town. The Siddal club is a leading member of amateur rugby league's flagship National Conference League. Greetland All Rounders and Ovenden are former members. Halifax has several senior rugby union clubs. They include Halifax, Halifax Vandals (Warley), Heath (West Vale), Old Crossleyans and Old Brodleians (Hipperholme). Crossley Heath Grammar School normally excels in nationwide school competitions. Motorcycle speedway racing has been staged at two venues in Halifax. In the pioneering days of 1928–1930 a track operated at Thrum Hall. A Halifax team took part in the English Dirt Track League of 1929. Speedway returned to Halifax at the Shay Stadium in 1949 and operated until 1951. The team operated as the Halifax Nomads in 1948 racing three away fixtures. The Halifax Dukes, the name they took once the Shay was opened, operated in the National League Third Division in 1949 before moving up to the Second Division in 1950. Riders including Arthur Forrest, moved on to Bradford. The Dukes re-emerged in 1965 as founder members of the British League and operated there for many years before the team moved en bloc to Odsal Stadium, Bradford. The steeply banked bends of the track at the Shay have been buried under stands at either end when the spectator facilities were squared off. The 15th-century Minster dedicated to St. John the Baptist did not achieve cathedral status when a new diocese was being considered for the West Riding (Wakefield Parish Church became the cathedral in 1888 and was extensively altered and enlarged). Minster Status was conferred on the Parish Church in a ceremony on 22 November 2009. There is a collection of rare Commonwealth white glass as well as a series of Victorian windows. Another feature is the complete array of Jacobean box pews. The pair of Gothic organ cases by John Oldrid Scott now house the four-manual instrument by Harrison & Harrison. The belfry holds fourteen bells and an Angelus. St Mary's Roman Catholic Church is located on the corner of Gibbet Street and Clarence Street, was originally built in 1839, rebuilt in 1864 and extended in 1924. The Serbian Orthodox Church dedicated to St John the Baptist, in the Boothtown area, formerly the Mount Carmel Methodist Chapel, was acquired in 1956 and after extensive refurbishment was opened in the 1965 by the town's Serbian community. In 2015 the church celebrated its Golden Jubilee. The currently mothballed mid-Victorian All Souls' Church by Sir George Gilbert Scott standing part way up Haley Hill to the north of the main town centre is now vested in the Historic Churches Preservation Trust. Its lofty 236-foot (72 m) spire and white magnesian limestone exterior stand as a very personal statement in 13th-century French style of the mill owner Colonel Edward Akroyd, who paid solely for its construction as the centre-piece of a purpose-built model village ("Akroydon"). All Souls' boasts an unusually complete sequence of windows by the leading artists of the 1850s, including William Wailes, John Hardman and Clayton & Bell. The large organ by Forster & Andrews inserted in 1868, ten years after the building was completed, is currently unplayable and many of its surviving parts are in storage awaiting restoration. The tower houses a ring of eight bells. Other churches include the Georgian Holy Trinity Church (now converted to office use) and the late neo-Gothic (1911) St. Paul's, King Cross, by Sir Charles Nicholson. St Paul's is notable not only for its fine acoustics but also for an unusual and highly colourful west window, specified by Nicholson, showing the apocalyptic vision of the Holy City descending upon the smoky mills and railway viaducts of Halifax as it was before the First World War. The Church of St Jude in Savile Park, designed by local architect William Swinden Barber in 1888, is easily identified by the four large pinnacles on its tower. There is also a more modern Christadelphian church, located on Balmoral Place. The spire of the Square Church, not far from the minster at the bottom of the town, paid for by the carpet manufacturing Crossley family, is all that remains of the Gothic Congregational church built by Joseph James in 1856–58 as a rival design to All Souls', Haley Hill. The building was closed in 1969 and arsonists caused severe damage to the building two years later leading to its partial demolition. The rather comic story of the rival spires runs that the two buildings' towers were nearing completion simultaneously; the architects were ordered to stop work within a few feet of the top of the spires to see who would finish first. After some time, the Crossleys lost patience and finished their spire at 235-foot (72 m), prompting the immediate completion of the rival building one foot higher. The neighbouring and earlier (Georgian) Square Chapel (1772) survived a hundred years of use as a church hall and Sunday school for the larger church: it is currently an arts centre. ^ a b "We're a Minster town!, Published Date: 23 November 2009". Halifax Courier. Retrieved 27 November 2011. ^ "Halifax Minster: the start of a new era". Halifax Courier. 24 November 2009. Retrieved 27 November 2011. ^ a b Watts, Victor, ed. (2010). "Halifax". The Cambridge Dictionary of English Place-Names. Cambridge University Press. ^ Ekwall, Eilert (1936). The Concise Oxford Dictionary of English Place-Names (Fourth edition 1960 ed.). ^ "Halifax: Nova Scotia, Canada". Encyclopædia Britannica. Retrieved 4 October 2017. ^ "Halifax Minster.org – Organ History". Archived from the original on 10 March 2014. ^ "Arms of Halifax, Civic Heraldry of England and Wales". Civicheraldry.co.uk. Retrieved 27 November 2011. ^ "Yorkshire History – Halifax Gibbet". Archived from the original on 3 March 2008. ^ The association of the three names pre-dates Taylor as the poet Thomas Nashe refers to them: "...neither in Hull, Hell, nor Halifax." – Nashes Lenten Stuffe, London, 1599. ^ "Radio 4 History – The Halifax Slasher". BBC. Retrieved 27 November 2011. ^ a b "2004 Calderdale Ward Digest – Census 2001" (PDF). Calderdale Council. August 2004. Archived from the original (PDF) on 27 March 2009. Retrieved 11 October 2008. ^ "Halifax Courier London rail link: (30 January 2009)". Halifax Courier. 29 January 2009. Retrieved 27 November 2011. ^ "Yorkshire Tiger services south Calderdale". wymetro.com. Archived from the original on 10 February 2013. Retrieved 26 September 2010. ^ "Give Halifax a proper station". Halifax Courier. 2 March 2007. Retrieved 19 May 2014. ^ "League Tables: The Crossley Heath School". BBC News. 11 January 2007. Retrieved 16 May 2007. ^ "League Tables: The North Halifax Grammar School". BBC News. 11 January 2007. Retrieved 16 May 2007. ^ "University Centre Calderdale launched". Leeds Beckett University. Archived from the original on 8 February 2009. ^ "Burden of booze must be shared". www.halifaxcourier.co.uk. ^ "Wainhouse Tower, Halifax – Icons of England". Retrieved 25 March 2011. ^ "Introduction: Wainhouse Tower: Calderdale Council". Archived from the original on 14 May 2011. Retrieved 25 March 2011. ^ "People's Park". Calderdale Council. Retrieved 16 April 2014. ^ "Territorial army Drill Hall, Halifax". British Listed Buildings. Retrieved 28 August 2017. ^ "Crossley Heath upset Warwick". Daily Mail. London. 9 February 2005. Retrieved 11 October 2008. ^ "In Focus: Crossley Heath". Daily Mail. London. 23 February 2005. Retrieved 11 October 2008. ^ Hooley, Jim (25 April 2005). "Channing chips in". Daily Mail. London. Retrieved 11 October 2008. ^ "Halifax – St Marie / Diocese of Leeds / Dioceses / Home / Taking Stock – Taking Stock". taking-stock.org.uk. Retrieved 30 December 2015. ^ "St. John the Baptist Church history". St-johnthebaptistchurch-halifax.org.uk. Retrieved 27 November 2011. ^ "St Paul's, King Cross | Homepage". Archived from the original on 9 October 2011. Retrieved 25 March 2011. ^ Historic England. "Church of St Jude, Free School Lane (1254029)". National Heritage List for England. Retrieved 18 February 2014. ^ "Washington Governor Ernest Lister". National Governors Association. Retrieved 28 October 2013. Hargreaves, John A. (1999). Halifax. Edinburgh University Press. ISBN 1-85331-217-7. Hilditch, Geoffrey (2006). Halifax passenger transport from 1897 to 1963: trams, buses, trolleybuses. Catrine, Ayrshire: Oakwood Press. ISBN 0 853616 47 7.